He was announcing the appointment of Mersey, a 71-year-old man, to sit in charge of the Wreck Commissioners Court. The Court was an independent tribunal with full powers to mould the inquiry according to its own discretion, Mr Asquith declared. Mr WATT - Has not the Board of Trade some representatives on the tribunal? Mr ASQUITH - No, Sir. Replying to Mr PETO, The Prime Minister said the Board of Trade had absolutely no power to direct the course of the inquiry. Major ARCHER SHEE - Under the Merchant Shipping Act, must not the Court report to the Board of Trade itself? How is that possible if they may find that the Board of Trade has been culpable? Mr ASQUITH - There is no difficulty at all. They send their report to the Board of Trade and they are perfectly entitled to find the Board of Trade culpable. WHY was Sir Edward Carson, one of the most illustrious lawyers and politicians of early 20th Century Britain, so cynical about this appointment? What could cause him to imagine that Lord Mersey might be so pliant? John Charles Bigham, the later Lord Mersey, was appointed a Queens Counsel in 1883. Bigham was born in Liverpool, the son of a Liverpool Merchant. The name he took on his elevation to the peerage reflects Liverpools Atlantic seaway and its vital importance to the commercial fortunes of the realm. Mersey joked at the time that in the matter of adopting a geographical name for ones Lordly title, he was leaving the Atlantic to F. E. Smith, another luminary of the law library. The Mersey and the Atlantic were part of the same gold-veined thread of commerce that had helped to make Britain great. Bruce Ismay was also born in Liverpool, the son of a Liverpool shipowner. It can be seen from newspaper reports of attendance lists at various functions that Bigham and Ismay were occasionally at the same gatherings in Liverpool from the beginning of the 1880s onwards. Such is to be expected. In the same way, Ismay and Professor John Harvey Biles (one of Lord Merseys Titanic assessors) were both long-time members of the Shipwrights Company, a professional club that also included Lord Pirrie. And as late as June 1909, Lord Pirrie, Biles, J. Bruce Ismay and Lord Mersey himself (then Sir John Bigham) were together as guests at a dinner of the Shipwrights Company in London. Indeed on July 21, 1910, Professor Biles was installed as Master of the Shipwrights Company and afterwards entertained staff and a few friends" at lunch - among them his immediate predecessor, Lord Pirrie. There is no clinching evidence that Ismay and Mersey were personally friendly  but Mersey must at the very least have been familiar with the shipping line family. One proof of this is that the Titanic judge happened to preside at a court case in 1906 arising from a road traffic accident involving Bruce Ismays mother! [Mrs (T. H.) Ismay, and Miss Bibby (of the Bibby Line family), were being chauffered in Scotland when there was a collision on September 22, 1905. The Ismay car, a Panhard-Levassor, came together with a Daimler driven by a Mrs Manville, a racing driver, who had twice taken part in the Herkomen International Trophy road race. And Bigham did know powerful men in the shipping industry, moreover from a very early time. In January 1900, the then Bigham QC was prominent in a drive to raise a body of yeomanry and volunteers to embark for the Boer War in South Africa. He personally donated £300 to this end, and secured contributions of £260 each from three shipping lines: Elder Dempster, Cunard  and White Star. It was evidently a cause that was close to the later Lord Merseys heart. And he was also clearly a persona grata to the shipping companies. Meanwhile it is an odd coincidence that both Bigham and J. Bruce Ismay were both putative or actual political candidates, of the same broad philosophy, and in the same region. The unavoidable withdrawal of Colonel Le Roy Lewes as Unionist candidate has created a difficult situation among Unionists in the constituency [of Ludlow, Shropshire]. This incident, which eluded Ismays biographer Wilton Oldham, eventually saw the Liverpool man gracefully withdraw from what was a crucial by-election. One Rowland Hunt, a local farmer, was found to fit the bill. Ismay did, however, preside over some of his meetings, as well as provide him with a car to tour the constituency. Hunt was victorious. In 1895, John Bigham QC, representing the Liberal Unionist party, finally won the Exchange Division seat in Liverpool over Mr W. B. Bowring (Radical) by 2,884 votes to 2,630, a majority 254 votes. Bigham, the lawyer and politician, had become a Member of Parliament. He had previously been defeated by 65 votes (in the election of 1892) in the same Liverpool constituency. On that occasion he was edged out by Mr Ralph Neville QC, the sitting Gladstonian member. Indeed, as far back as 1885, two years after he had been called to the Inner Bar, Bigham had been hungry for political attainment. In that year he unsuccessfully contested the East Toxteth Division of Liverpool as a Liberal candidate, losing to the magnificently-named Baron Henry De Worms. Unionism clearly occupied the concerns of both Bigham and Ismay. That meant a resistance to Home Rule for Ireland, where ships were built for the Liverpool lines. Mr Bigham QC , the Liberal Unionist candidate, last night addressed a crowded meeting in the Rotunda Lecture Hall, but he was persistently interrupted by Irish Nationalists, about fifty of whom had packed themselves in one corner of the hall. At a recent Gladstonian meeting, Mr Neville had advised the people to attend Mr Bigham's meeting and ask him what he said in 1885, and last night's disorder is believed to have been the result. The interruptions were often of a disgusting and ribald character. The body of the meeting was enthusiastically Unionist, but the disturbance could not be repressed, and while one party sang Rule Britannia and the National Anthem, the other sang God Save Ireland. Some of the intruders were ejected for their rowdy conduct, and two were handed over to the police and conveyed to the Bridewell, where their names and addresses were taken. But it turned out that a career in the Mother of Parliaments did not altogether suit Mr Bigham. And within a few years he had secured a plum post as a senior judge  a Government appointment, for which he was no doubt grateful. 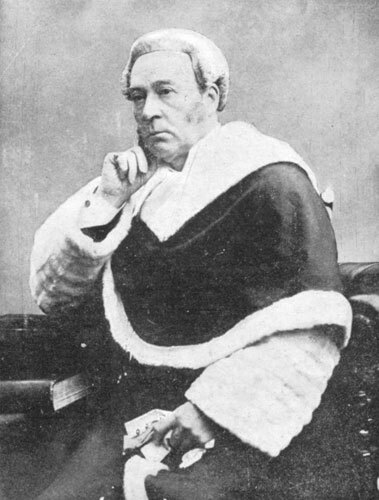 John Charles Bigham QC was appointed to the High Court in October 1897. He vacated his seat in the Commons upon his elevation to the bench. "The new judge entered the court attired in full bottom wig and scarlet robes. He remained standing on the bench as he repeated the words of the oath, which was read by the Master of the Crown Office. His Lordship then kissed the book and received the congratulation of his brother judges." "The President, Mr F. M. Sherwood, said that the judicial bench would be greatly weakened if it were to be supposed that a Parliamentary career disqualified a man from attaining judicial rank. In his speech of thanks, Mr Justice Bigham said that he had left his work at the Bar (for the bench) with the greatest reluctance. It was the occupation in which he took the deepest delight, and when he left it, he doubted as he did so, whether the happiest years of his life had not been passed." It will be seen from the above that MPs who were barristers could, and did, still practise at the law while holding a seat in the House of Commons. Bighams special affinity remained in shipping cases. It is a curious to note however that his advocacy was always spiritedly carried out on behalf of the shipping lines, whether they were plaintiffs or defendants. Not for Bigham the taking up of cudgels on behalf of the little man. When Bigham became a judge, however, he was expected to deal with criminal cases. In this area his record is most interesting, and his judgments and sentences mercurial. Sometimes the sea came back within his scope. A man named Guy was found guilty of setting a fire on the ship Ada at Southampton in 1902, and was sentenced by Bigham to the hefty term of three years penal servitude. Two years later, a ships fireman named Charles Harrison, described in the newspapers as a man of colour, was convicted for the violent robbery of a watch, which he later pawned. He had wielded a stick at a terrified couple, who fled his demands. The 28-year-old fireman confessed that it was the very first time he had been arrested. He had been drunk at the time, and had not actually struck anyone, he said. 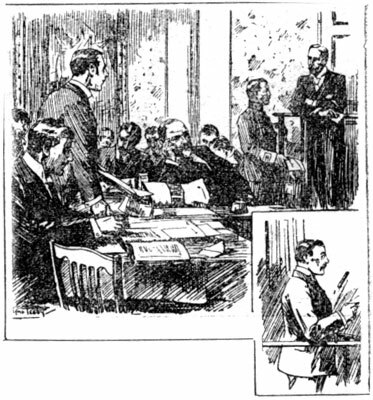 The sentence Mr Justice Bigham imposed was exemplary in the extreme. Describing Harrison as a "wicked and violent monster," he sentenced him to ten years penal servitude. Mrs. Penruddocke, convicted of cruelty at the central criminal court.  November 21st. As a criminal judge, Bigham president over several trials that attracted much public attention. In 1902, a lady, a member of a well-known member of a Wiltshire family, was charged with the ill-treatment of her young child. Public feeling ran high in the neighbourhood where the family lived, and the venue was moved removed to the Central Criminal Court, where she was tried before Bigham. This was the Penruddocke case, and its details are shocking even today. There is no need to recount the precise tortures inflicted on the child by its well-heeled mother, but they included deprivation of food, clothing, and bed-linen, and the use of nettles, birch rods, wasps, items introduced into the childs gullet, and other forms of maltreatment, including belittlement, exclusion and psychological abuse. The case was brought by the Society for the Prevention of Cruelty to Children. It had been aware for years of what was alleged to be happening to Letitia Constance (Connie) Penruddocke, but it was only when servants of the family agreed to give sworn affidavits that a case was finally brought. Controversy over this decision rumbled in the newspapers for several weeks. The judge went on to throw the book at a Liverpool bank clerk name Goudie, who had defrauded his employers of a sum of £175,000, equivalent to £10.2 million today. The hunt for Goudie (who had been quietly living in Berry St, Bootle, all the while) was a national hue and cry. He was eventually betrayed by his landlady, enticed by a reward. Goudie is the subject of one of the earliest British newsreels, produced by Mitchell and Kenyon. Bigham saw to it that the young defendant died in prison. The Charge against Mr. Whitaker Wright at the Guildhall.  August 25th. Though it would not be true to say that counsel had not the opportunity of saying all that was possible for the prisoner, it was a matter of common observation that Bigham showed hostility to the accused from the outset, and he drew from Lawson Walton, who was leading for the defence, an unusual protest on the ground that the judge had raised the laughter of the gallery against his client. It will remembered that the sentence of seven years' penal servitude passed by Bigham was not served, as the prisoner took poison [cyanide, exclaiming So this is British justice!] immediately after it had been commenced. It should be said that The Times, the in-house newspaper of the British Establishment, was not usually prepared to speak ill of the dead. Quite the reverse. 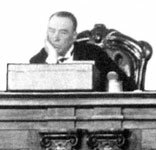 Bigham moved through the system, and eventually left the Bankruptcy Court in February 1909 on promotion to the post of President of the Divorce Court. He now found himself listening to endless tales of marital woe, tiresomely laundered in public. Because some high-profile cases inevitably came into the public spotlight, he is today immortalized in minor degree by more than one named reference in George Bernard Shaws play Getting Married (1911). 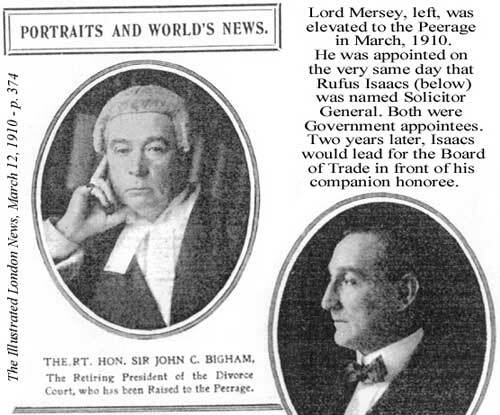 In March 1910, Bigham was raised to the Peerage as Lord Mersey. A question in the House of Commons disclosed that he had been granted a full judicial pension, despite it normally being payable on 15 years' service, for which he fell two and a half years short. It turned out Bigham had produced a medical cert for some unspecified illness, but it is unclear which came first  his retirement or further preferment. In any case he left the bench for a seat in the Lords, a man who was very obviously in the continuing kindly eye of Government. He was thus retired from the Probate, Divorce and Admiralty Division of the High Court when the Titanic Inquiry came up, and had been for two years. In fact his only recent quasi-judicial involvement had come in late February 1912 when he was suggested as a final arbiter in a bitter strike by Glasgow dockers over pay and conditions. Mersey gave judgement in favour of the ship owners, and the grumbling hundreds had no option but to go back to work. Stanley Lord of the Californian felt he had certainly not got a fair hearing from Mersey in the course of the Titanic Inquiry. Merseys obiter dicta in the transcript of evidence are spectacularly hostile in the matter of the Californian from the start. And when the report was produced, it was so satisfactory that Lord Mersey suddenly enjoyed a career rebirth  although there were many private complaints about his palpable and growing deafness. In 1915, Lord Mersey produced a report into the sinking of the Lusitania that was nothing short of what he felt his nation required. His claims of at least two torpedoes, and possibly two or three submarines lying in wait for the great Cunarder, have been shown in historical retrospect to be utterly untrue. Before the war Mersey produced an Empress of Ireland decision against the owners and operators of the humble Norwegian collier Storstad that has been demonstrated to be equally malign and false. Not that it fell short of fulfilling expectation. Also in the course of the Great War, Merseys judgment in the important case of the torpedoing of the Falaba has been shown to be at variance with the testimony of many witnesses, including neutrals, not to mention the account of the U-boat involved. But Lord Merseys fame in shipping circles today owes itself entirely to his fortuitous appointment to head Inquiries into the three greatest shipping disasters of the early 20th Century. On the face of it, he was suddenly hand-picked for the Titanic Inquiry, plucked from retirement while the Probate, Admiralty and Divorce division was not lacking in serving High Court judges. Yet Sir Edward Carson - for some reason - was unsurprised at this seemingly odd turn of events. Perhaps he recalled that Bigham had made it a point throughout his career never to miss the Annual Dinner of the Chamber of Shipping! Less than three years later, this man had sole control of the ramifications of the Titanic sinking. Did he act in the public interest? Mersey eventually became a Viscount. His son Charles, who had acted as his fathers secretary at the Titanic Inquiry, would enjoy similar recognition and high reward. Lord Merseys second son, Trevor Bigham, who had never shown much aptitude for business, was appointed an Assistant Commissioner of the London Metropolitan Police in January 1914. He was aged 36 at the time. Nice work, all of it. Does one imagine that the British Government, in bestowing such favours, was influenced by Lord Merseys reports for the Board of Trade? No - it is an insult to Lord Mersey to suggest it.